Finding the team, the ideas and the means to co-create a "more caring and sharing community": My priorities as a restorative practitioner in relation to: victim comfort, a burglar's life and/or the safety of the public? My priorities as a restorative practitioner in relation to: victim comfort, a burglar's life and/or the safety of the public? My concern is that restorative justice develops in a way that doesn't just serve one interest group at the expense of the lives of others. Whilst I paid much attention to 'victim satisfaction', I was unwilling to prioritise a victim's comfort above the risk of an offender taking a lethal overdose of drugs if he didn't come out of the restorative meeting with a believable plan for change. Beyond the life of that offender, what was at stake was the safety of the public at large; the 'recidivist burglar' has much to teach us if we want to break the cycle of crime. 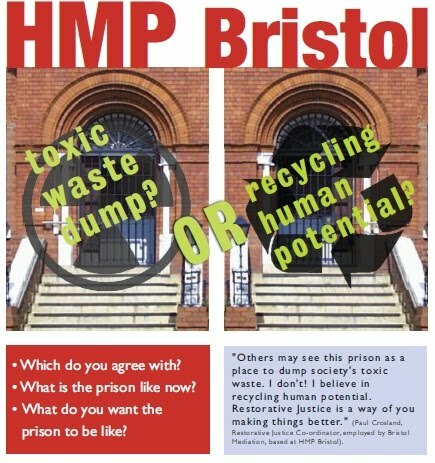 This was my position at HMP Bristol and in 2008 it became a resigning issue. The conflict underlying my resignation is very alive for me; all the more pertinent as the Criminal Justice System considers ways to cut costs and deliver better results. I suggest that we start by treating prisons not as 'Toxic Waste Centres' but as 'valuable recycling centres for safer society'.